The San Diego Yes show was terrific! A real treat for us YesSuckers. I can't wait for Friday in LA. The Open Air Theater at San Diego State University is a nice, small venue. We had seats 1 and 2 in row 8 in section EEE (seating chart at http://www.atlastickets.com/openair.htm). The seats rise sharply upward - overall good sound. I went with my friend Frank, the only concert-going-Yes-fan friend I have left these days. :( He hadn't seen then since the Union tour, so he was basically uncontrollable and had frequent outbreaks of histeria. Alan Parsons was good, and they started fairly promptly - shortly after 7:00pm. I did listen to them, but only a couple of songs from our seats, then we scooted to the top of the Amphitheatre where the refreshments were. This was fine because I was able to chat with some YesFans there, which was really cool, and still watch and listen to the band from above. From what I noticed from the songs I knew, they played them true to the studio recording, note for note, including solos. Of course, when the Firebird started, we immediately rushed to our seats. The set list was the same as previous shows: Siberian, RoL, YiND, OYE, AYAI, HotS, Howe solo, LDR, Whitefish, OoaLH, Wondrous, CttE, AGP, and the Roundabout encore. Interesting, I don't remember ever NOT hearing them play Starship Trooper, but they didn't. I'm not complaining - I've heard it a thousand times. I would have liked to hear RSoG again, but that's OK, too - since I got to hear my favorite two songs, YIND and CttE. Good trade. Towards the end of And You And I, a MAJOR sound glitch which sounded like Steve guitar cord got stepped on or yanked out of its plug. Steves guitar went quiet, and the whole band seemed lost, pausing. The problem was quickly fixed and the band came together in an amaing and professional manner to complete the song. Some of Igors sounds were a bit muddy this time around. I didn't care for the synth patch at the end of 'I get up, I get down', and his solo, although technically interesting, didn't sound mixed well. As usual, Billy was all background except for a short solo stint in the spotlight. Howe was simply incredible that night. I was watching Steve probably 75% of the time, and he particularly blew me away during his solos in YIND and CttE. He improvised much of his solos, which I like to hear. He didn't do Clap for the first time in the many years that I've seen him. My only disappointment was the crowd. 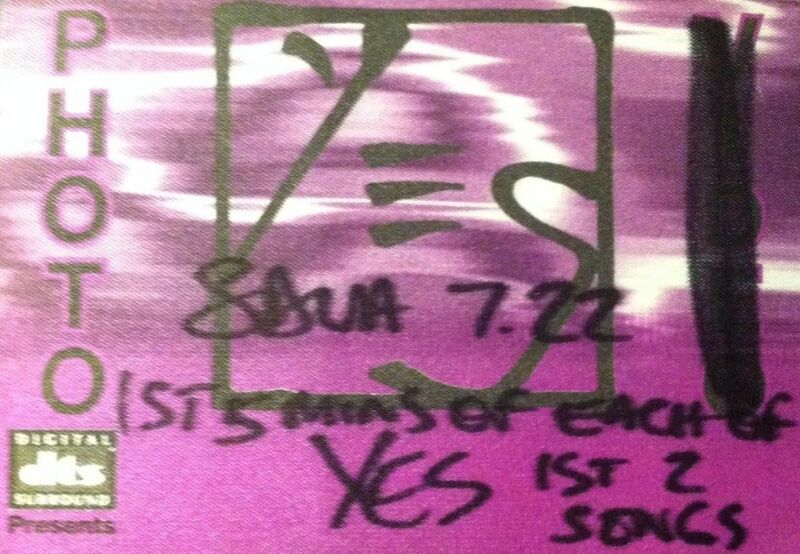 From where I was sitting, it seemed like most everyone had never seen Yes or didn't know what to think. I was grooving in my seat, and my friend and I wanted to dance throughout, but everyone around me looked pretty dull and bored. C'mon people! Groove to the music! My great-grandmother moved around better than most of the lifeless slugs at the show.